A one-time Slobodan Milosevic ally has become the first former Yugoslav army officer charged over war crimes in Bosnia and Croatia in the 1990s. Prosecutors say the charges establish an important link between the former Yugoslav army and separatist militias. Former Gen Momcilo Perisic, 60, handed himself in to the UN war crimes tribunal in The Hague on Monday. Mr Perisic said last week he was willing to face the court to defend his honour and the reputation of the army. He is accused of responsibility for war crimes committed by Bosnian Serb and Croatian Serb separatist forces - charges he denies. The prosecution argues that Mr Perisic was, in practice, the superior officer of the Bosnian and Croatian Serb separatist militias in the breakaway republics. "Gen Perisic is the first army officer from the former Yugoslav army to be indicted for crimes committed ostensibly across the borders in Bosnia and Croatia," tribunal spokesman Jim Landale told the BBC. "Now the link has been made by the prosecutors back to Belgrade and back to Gen Perisic himself." Reports of enduring links between the Yugoslav army and Bosnian and Croatian Serb units are not new, but there has been no such detailed case made before the tribunal so far, the BBC's Balkan analyst Gabriel Partos says. If the evidence presented at the Perisic trial supports the claims made in the indictment - or if he pleads guilty - the case could also have considerable significance beyond the tribunal, he adds. Bosnia and Croatia have both taken Yugoslavia to the International Court of Justice on charges of genocide - and the case against Mr Perisic could bolster those suits against Belgrade. In another development, the court's chief prosecutor said Serbia knew where top suspect Ratko Mladic was hiding. "They know exactly where he is and they could provide the arrest and transfer within hours," Carla del Ponte said in an interview with Reuters news agency, repeating an allegation she has made frequently before. A top Serbian government official rejected the allegation. 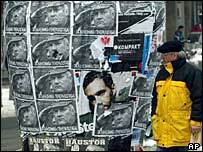 Interior Minister Dragan Jocic said police are hunting for Mr Mladic, a former general who is one of the most wanted indictees. Mr Perisic is the sixth former top Serbian military leader in five months to announce that he will hand himself over to the international tribunal investigating the Balkan wars of the 1990s. He was chief of staff - the head of the Yugoslav army - from 1993 to 1998, but began to break with Mr Milosevic as early as 1996, when he signalled that he would not allow Mr Milosevic to use the army against demonstrators in Belgrade. 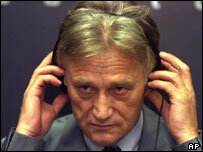 He was sacked in 1998 because he opposed the Serbian leader's repression of Kosovo. Mr Perisic then founded an opposition party, which was among those that helped to topple Mr Milosevic in 2000. He became a deputy prime minister under the late Prime Minister Zoran Djindjic, but was forced to step down in 2002 over allegations of spying for the US. What is a war crime?